In my next life, I want to be an interior designer. I love decorating and home decor, taking on projects, and helping others do the same. 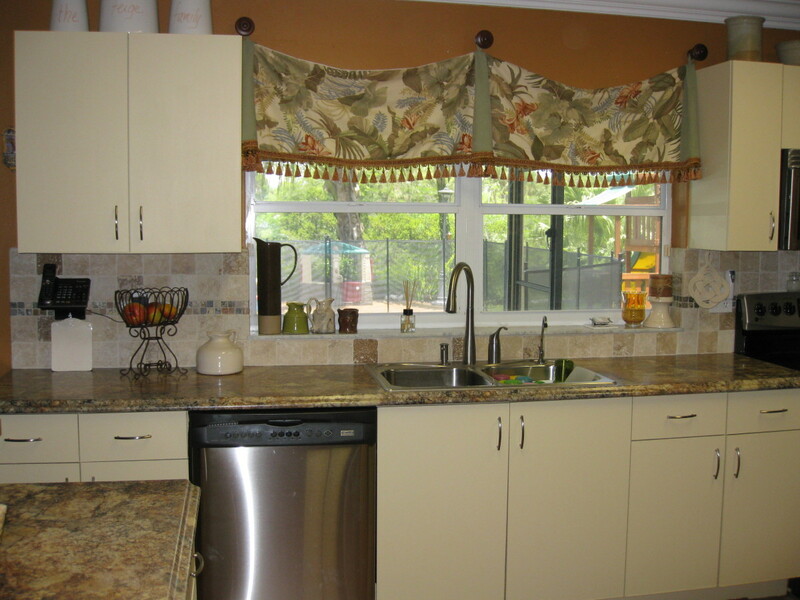 This article is for anyone thinking about kitchen remodeling on a budget. It is also for anyone considering laminate kitchen countertops; more and more people seem to be deciding against granite nowadays as less expensive options that are almost as beautiful become available, like the new Formica 180fx (read more about it down below, see all the Formica colors, and before and after pictures of my kitchen redo) which looks like granite stone. 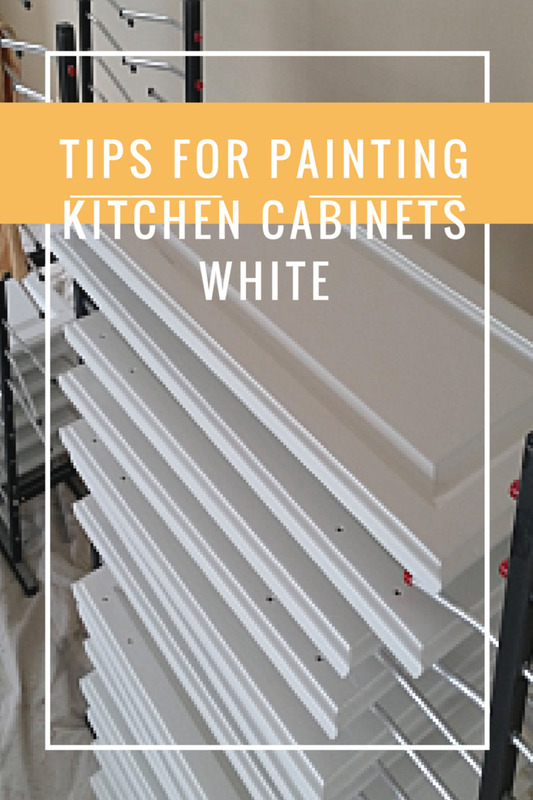 Painting kitchen cabinets is also a great money-saving way to give your kitchen a whole new look. 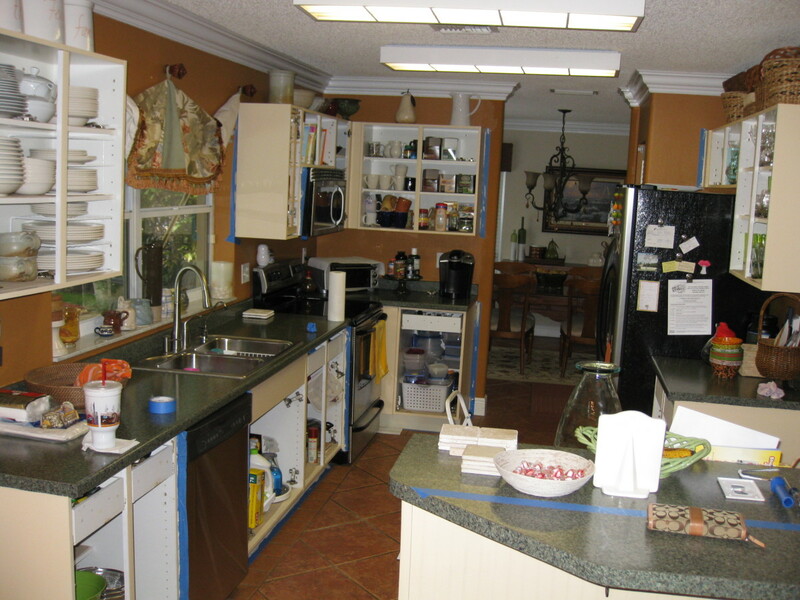 Keep reading and I’ll tell you my kitchen update story, with before and after kitchen remodeling pictures. I love my house; we moved into it just under two years ago. There are a few things I don’t like about it, but the positives far outweighed the negatives so we went for it. We really went for it—we purchased our house sight unseen. 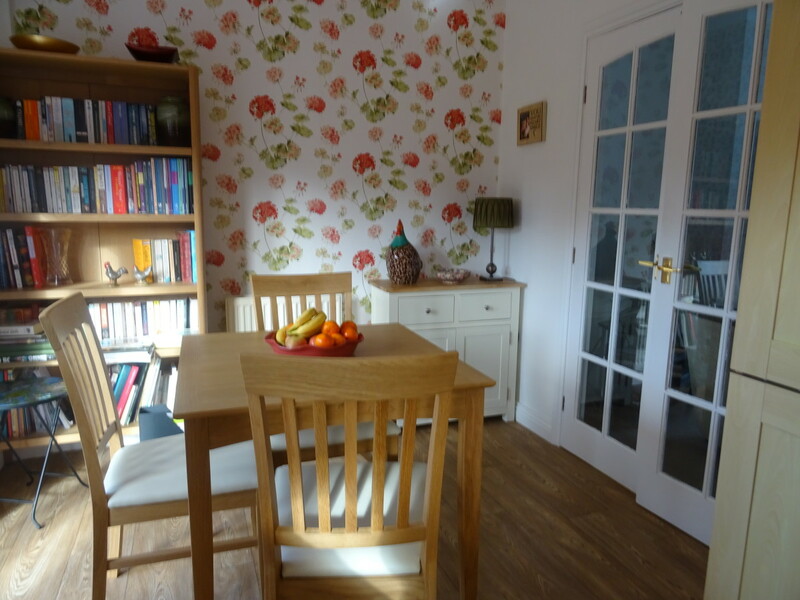 That’s right, we made an offer on this house based on photographs and a couple of videos and the opinions of my parents because we lived, at the time, 3500 miles away. Mom, I know you’re reading this—thank you and NO, I have no regrets, so stop feeling guilty every time I complain about something regarding the house! 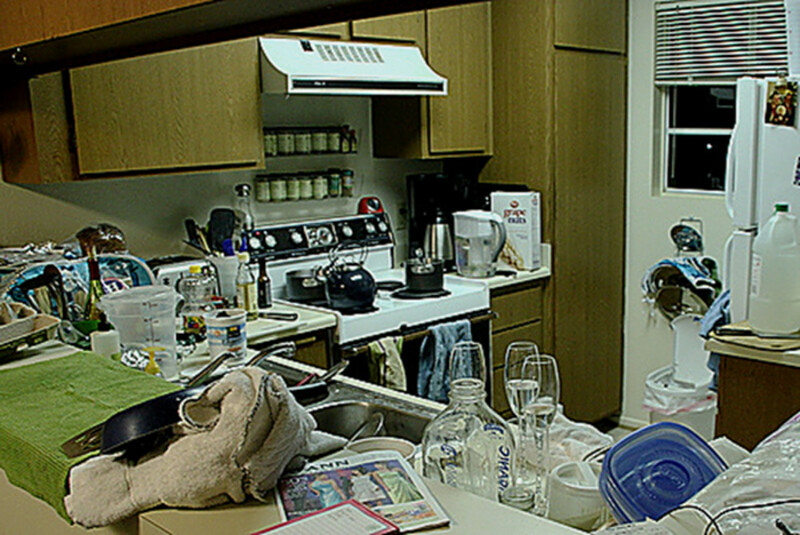 This is what the kitchen looked like when we moved in. The galley style is one of its best features. 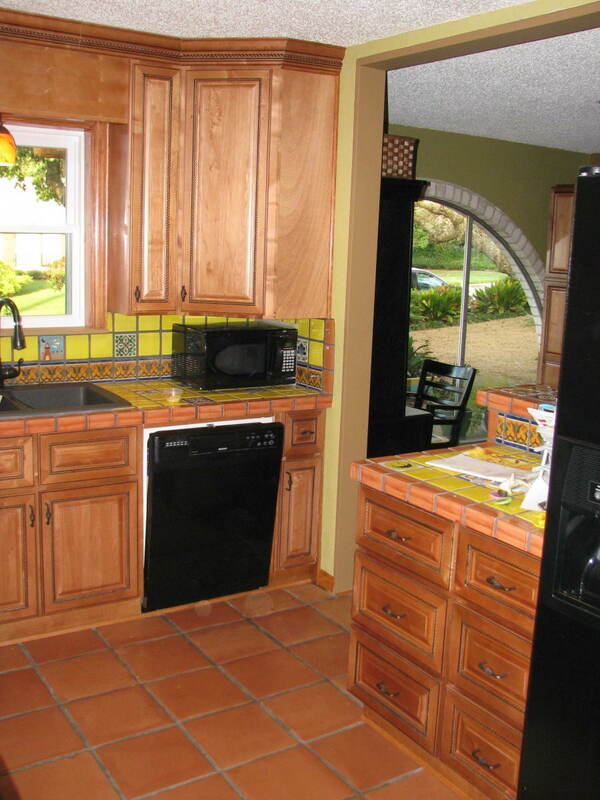 Ugly Formica countertops and faux-finished laminate cabinets. ...and new window treatments. 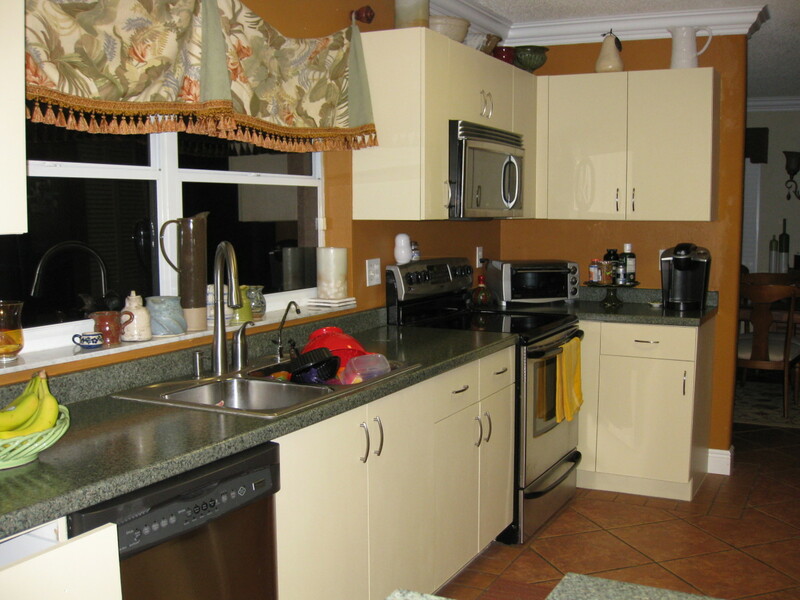 My kitchen has been completely transformed for the better for right around $2000!! We’ve slowly taken care of minor changes like painting some of the rooms, replacing old door handles, and adding storage spaces but major changes will come a bit further down the road, after we pay off our debt. One of the things I have disliked the most about our house is the kitchen. The house is 15 years old and as far as I know, the cabinets are original—particle board-covered with cheap laminate —and painted over by the previous owner in a dark grey-green river rock faux finish. I hate it because it’s just ugly and I scrape my knuckles on it all the time! 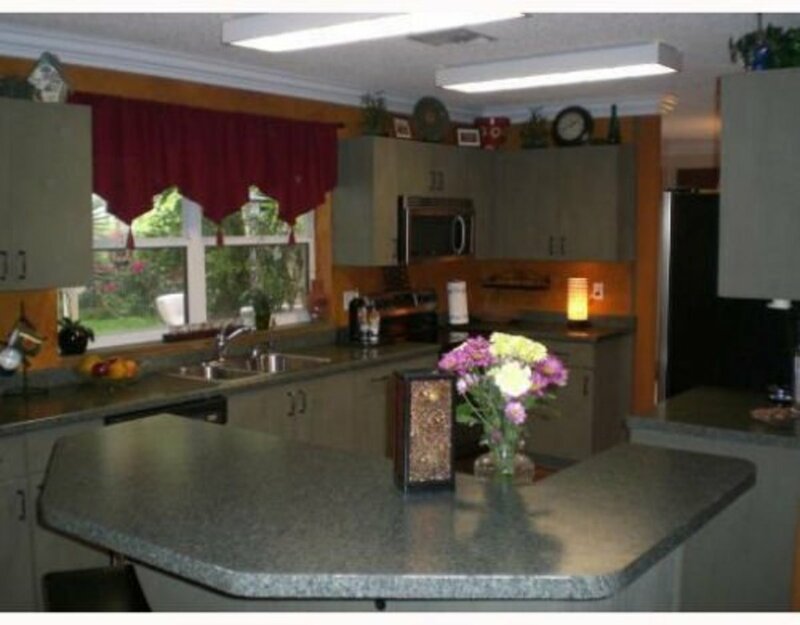 The countertops are a green and black granite-look Formica, also ugly. My favorite color is green, but my least favorite colors are gray and black, so these greens don’t do anything for me. 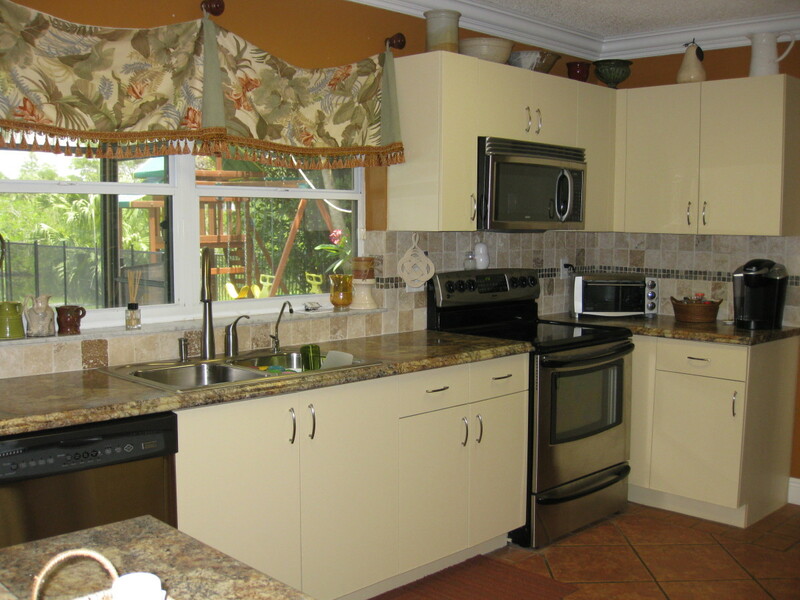 The great thing about the kitchen is that the appliances are relatively new—stainless steel dishwasher, range, and refrigerator and the galley style floor plan is great. Shortly after moving in we replaced the kitchen sink and faucet, as well as all of the door and drawer hardware and that made it “livable” for a little while, but not that long. 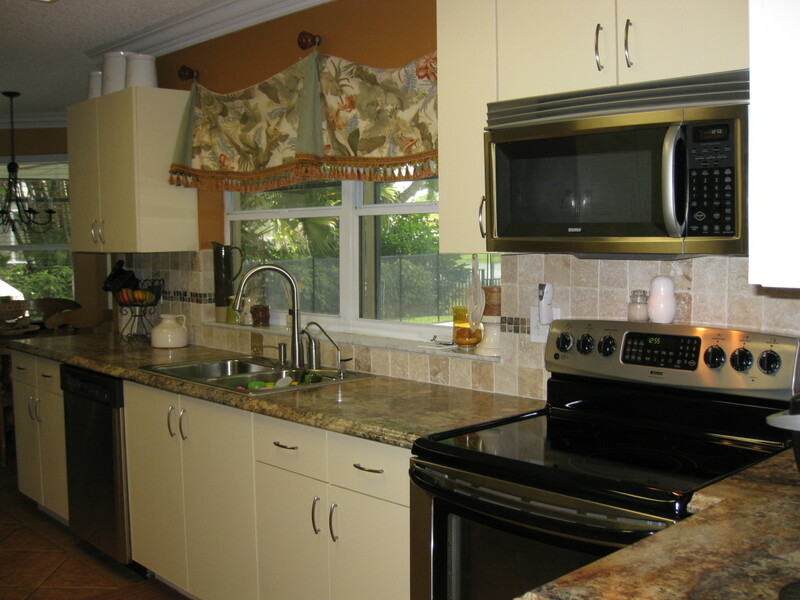 I’ve been itching to change the kitchen for the last year and I was even willing to replace the countertop with another laminate one – one that I could live with for three to four years – and figured it would cost around $600. Even though we are in debt repayment mode, I decided that if I could spend under $1000 to make my kitchen tolerable for 3-4 years (until our debt is paid off and we can afford new cabinets and countertops) then it would be worth the slight detour. 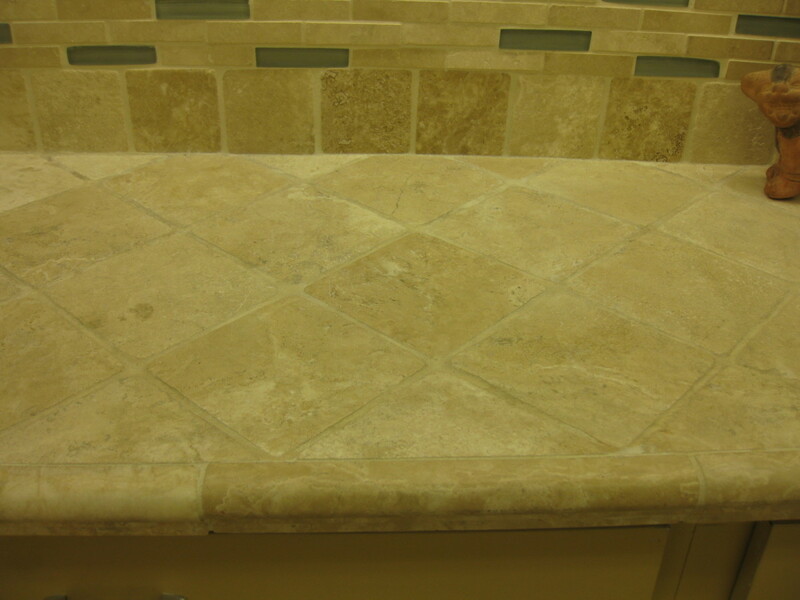 tumbled stone-look ceramic tile - beautiful, isn't it? 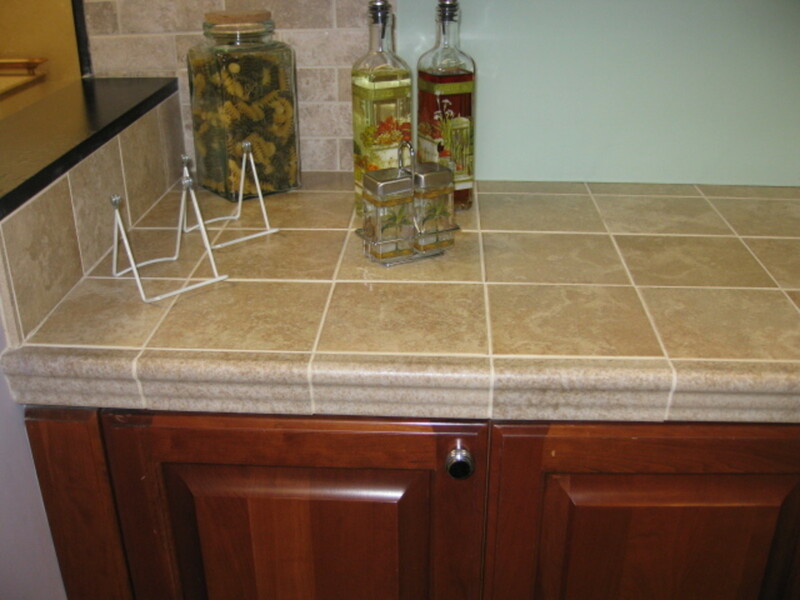 Actually, I first considered replacing the countertops with tile and I found a nice ceramic one that looked like tumbled stone. 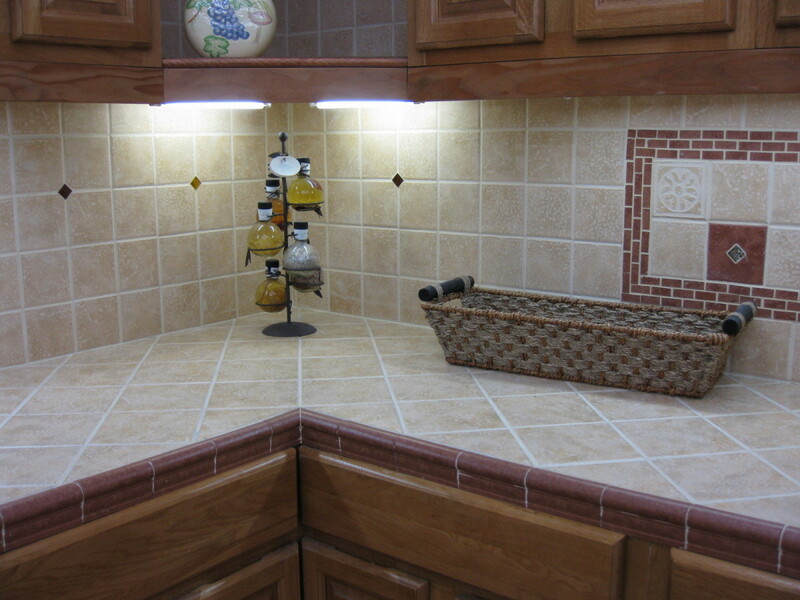 I thought tile would be the cheapest way to go, but for it to look good (to me) it would have to be laid on the diagonal and the edges had to be a “fancy” end cap because that’s what gives it a more classy (expensive) look. Turns out I have expensive taste – actually, that’s not new news. The tile job started adding up and that’s when I thought I’d have a look at the “new” laminates available because if they were to cost about the same, I’d rather not have to deal with the grout maintenance. I started looking around and making calls and one man (the company I ultimately decided to go with) asked me if I had seen the new 180 FX Formica. 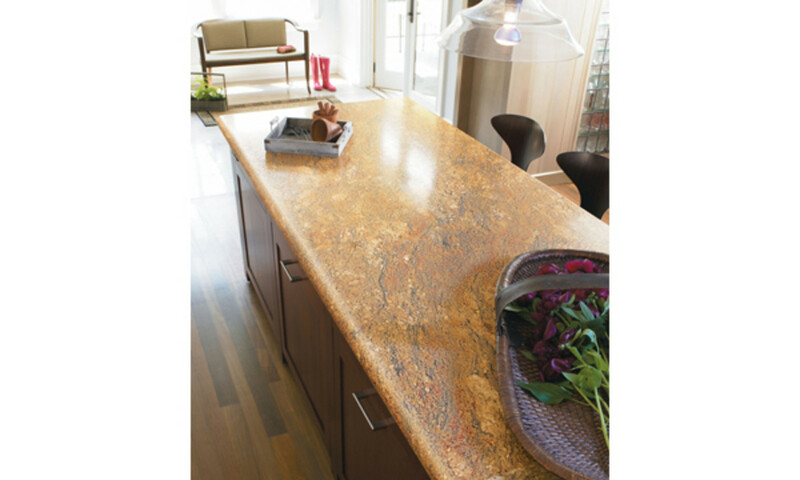 I hadn’t, so I logged on to the Formica website to take a look and low-and-behold, I found my new countertop! Never would I have thought that I’d actually be excited about a new laminate countertop! 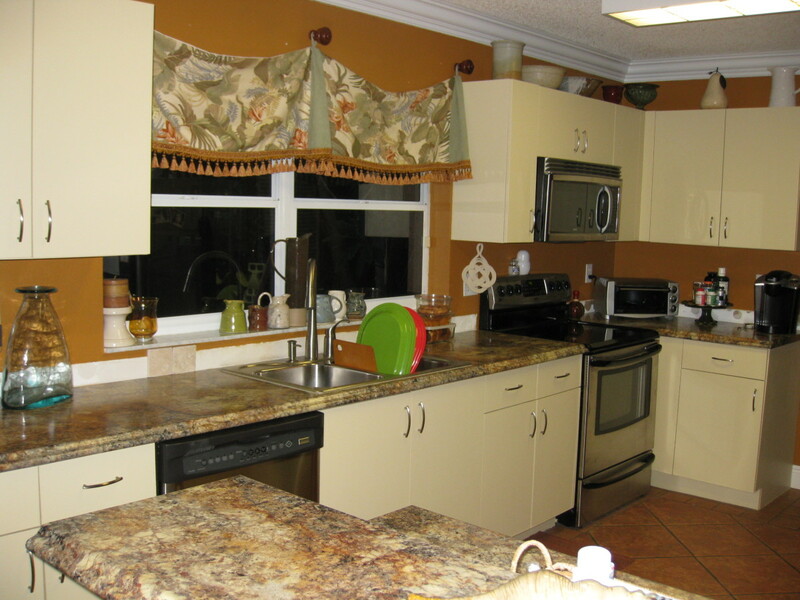 Formica patterns have traditionally had about a 15-inch repeat. 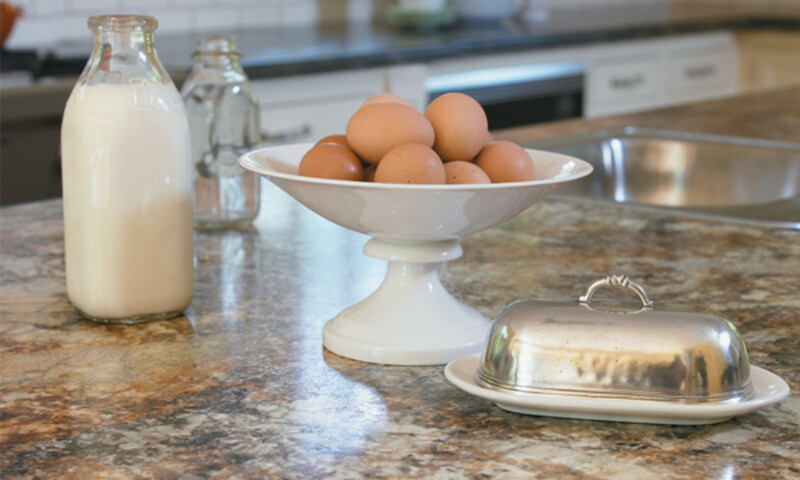 The new 180 FX Formica is created by taking a photograph of an actual slab of granite, thereby creating a 5-foot repeat on the finished Formica; it truly looks like a slab of granite. Why they didn’t come up with this idea sooner, because it seems like a simple one, I have no idea! Formica has also added an element to this countertop material that gives it a texture (very slight) and shine so that it looks even closer to the real thing. Of course, it does not have a lot of the properties of real granite countertops, such as the ability to place a hot pot directly on it, the inability to install an under-mount sink, and depending on what type of edge you select, it may not be able to wrap around all sides, but for a temporary fix I can deal with those negatives. 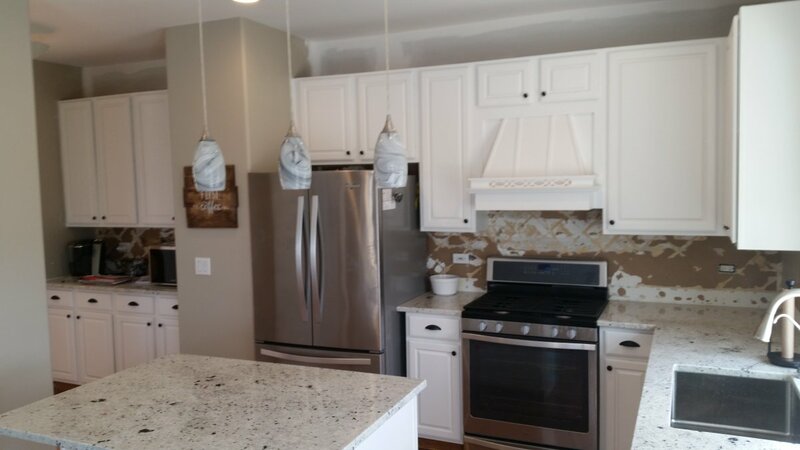 I made several visits to home improvement stores to get quotes and, as well as several calls to contractors and I found a great company, Countertop Guys, that does just countertops and after a couple of phone calls and faxes, I paid their factory a visit. I got to see a full 8-foot piece of this Formica 180fx in the color that I had selected as my favorite online and I fell in love with it. I fell in love with Formica—I still can’t believe I’m saying that. I even thought to myself that when the time comes that we are ready to replace our cabinets, I may even want to keep this Formica counter! As of this writing, the countertop has been ordered and will hopefully be ready to be installed next week. more Golden Mascarello - looks just like granite, doesn't it? Meanwhile, my husband and I selected a nice soft camel color to paint the cabinets. 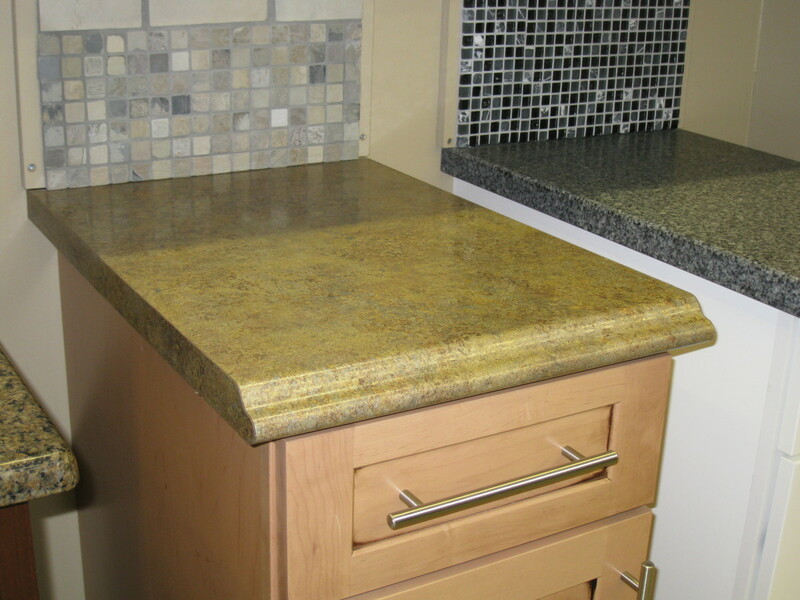 The color will look great with the décor we already have, as well as the new countertops. A few days ago I decided to take on the painting while my husband was out of town for the week. I dreaded it, but as I started I realized it wasn’t that hard. Little did I know that I’d end up painting four coats on the cabinet frames! What happened was that I purchased a primer that was recommended to me by one guy and when I went back the hardware store to get more supplies, when about three-quarters of the way through the priming, and was told by another guy that the primer I was using was not the right one. He said I needed a bonding primer, not just a stain blocking primer (due to the river rock faux finish on the cabinets.) So I bought more primer and had it tinted to a shade slightly lighter than the final paint color. I also purchased the paint color based on the swatch I supplied. So I got home and started over, but decided I wasn’t going to re-prime the insides of the doors and drawer fronts. 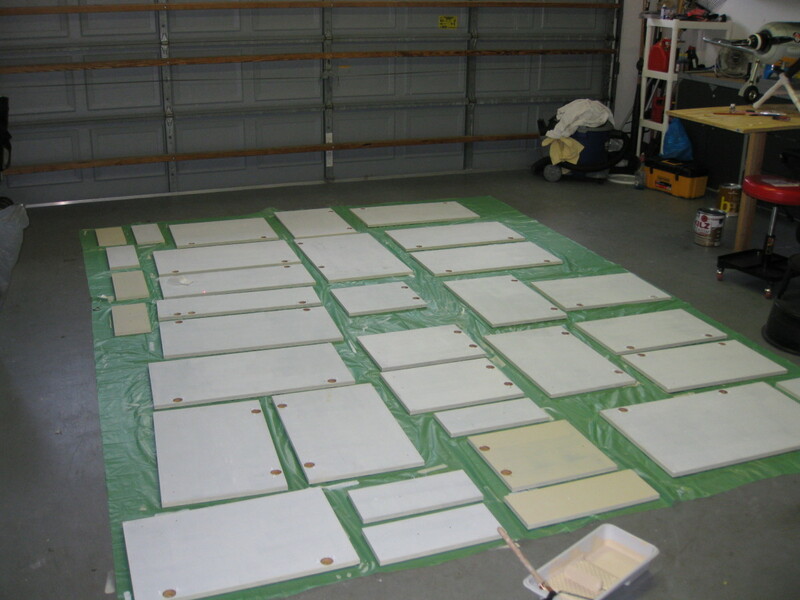 Priming done; next was to be the last step—painting everything with the beautiful soft camel color. Painting completed. Went to airport to pick up my husband. We walked into the house and I was excited for him to see what I had done and instead of seeing soft camel, we saw a peachy/pinky color! I thought maybe it was due to the reflection of our terra cotta colored floor tile or the burnt orange paint on the walls—or maybe the green I was trying to cover is somehow showing through and changing the color—or maybe it’s the light . . . we decided to go to sleep and see what it looked like in the morning with the sunlight. We woke up to a peach kitchen! I then grabbed the color swatch and held it next to the dab of paint placed on the lid of the paint can and it was not at all the same! As soon as the store opened, I brought the can back and told the paint-guy that we had a problem. Turns out that the formula he used was correct, although the color was not at all right, so he started from scratch. It took about an hour, adding drops at a time of pigment until we got it to what it was supposed to be. So I headed home and painted the fourth and final coat. That was yesterday. My shoulder and hand are killing me, not to mention my back, and I hope I never see a paint brush or can again! I am happy, though that my kitchen is on its way to greatness and I saved probably hundreds by painting myself. I’m very anxious now for the countertops to come in so that I can see the final product! trying to picture how the final kitchen will look ... yes, the next step will be a tumbled stone backsplash - found the tiles (4") for 22 cents each - less than $60 for my whole kitchen, full backsplash! all painted and put back together - finally! 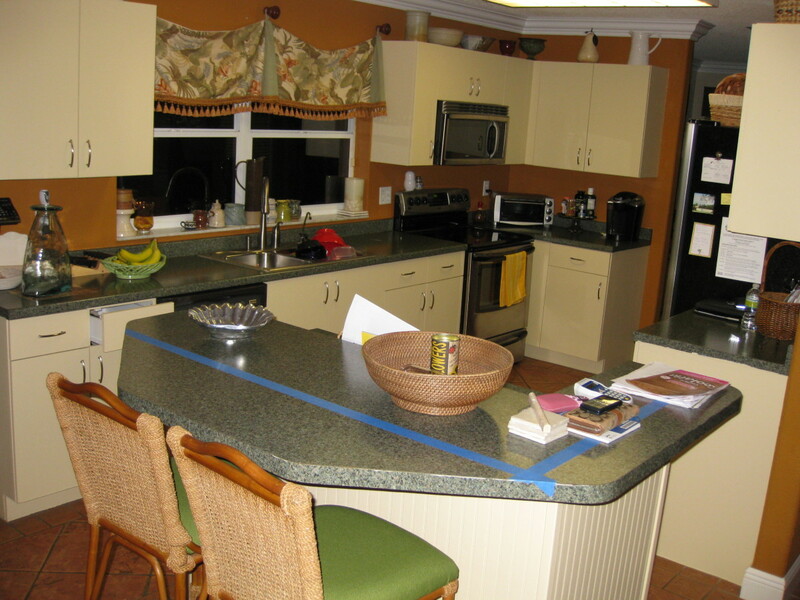 see the blue tape on the island countertop? that'll be the new shape when the new countertops arrive. what a transformation! I can't wait to see it with the new countertops next week! Yay - the countertops arrived! 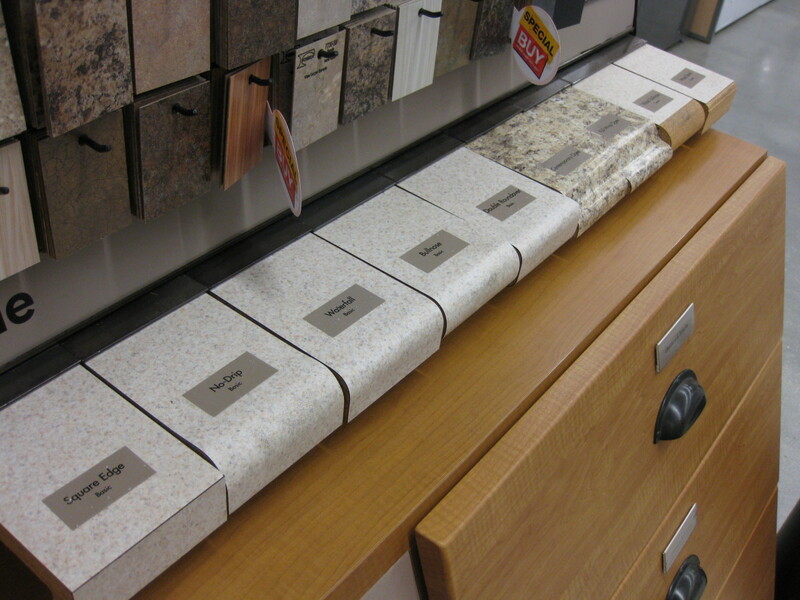 These are our new Formica 180 FX countertops - gorgeous! So that’s my kitchen story! It may be pretty boring to most, but hopefully helpful to someone! How do I feel about my Formica 180fx countertops after more than three years? I STILL LOVE THEM! I know I said it up above somewhere but I so never thought I'd even like Formica, let alone love it! Now don't get me wrong, only this type of Formica is fabulous. 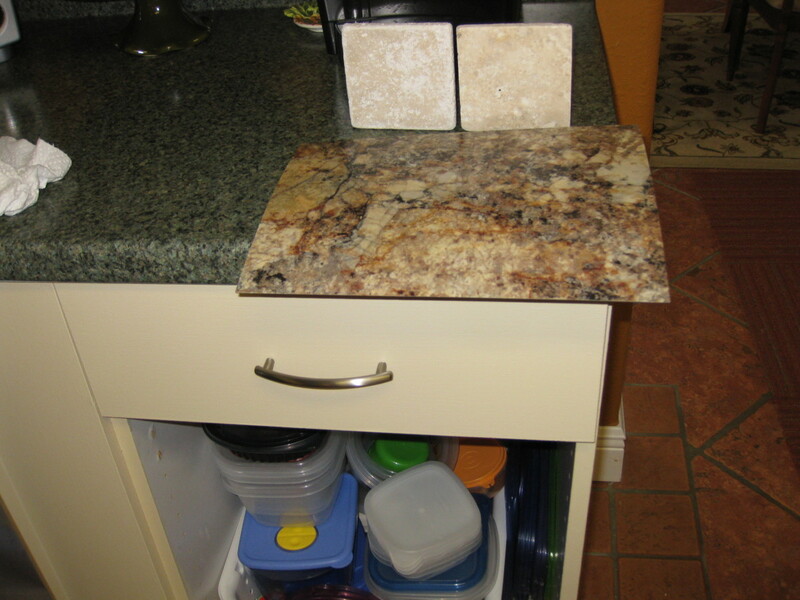 I have had no issues whatsoever with my countertops. I have always been accustomed to using trivets or towels—something under hot pots or dishes so protecting the Formica from excessive heat hasn't been an issue at all. They are still as perfect as they were the day they were installed. 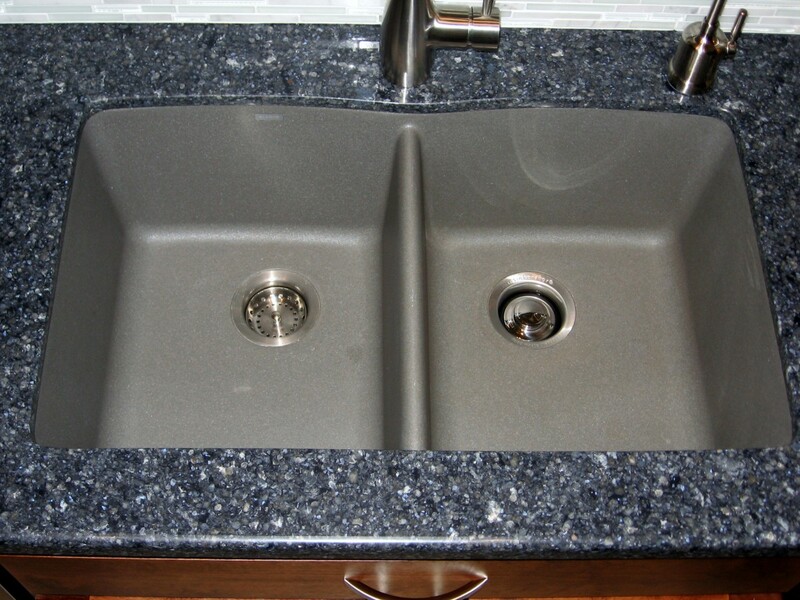 My one and only complaint is that you can't have an under mount sink with Formica countertops. It's not a deal breaker, but I'm kind of OCD about the water spots on the stainless sink so I'm constantly wiping down all edges of the dang sink - edges that would not otherwise be showing if it were under-mounted! 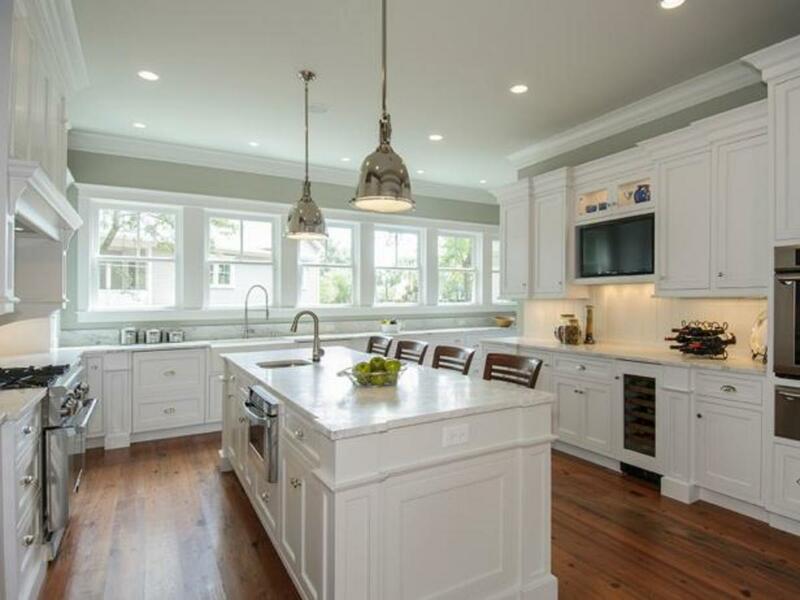 What's the Cost to Paint Kitchen Cabinets? The edge is "Ogee". Thanks for your comment! We're still loving them! 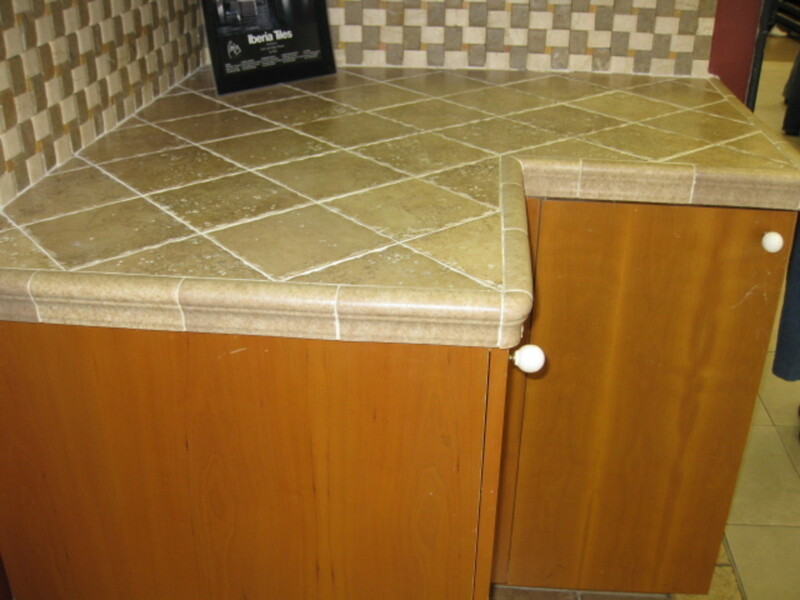 What type of edge did you get on your counters - they look fantastic! Thanks! 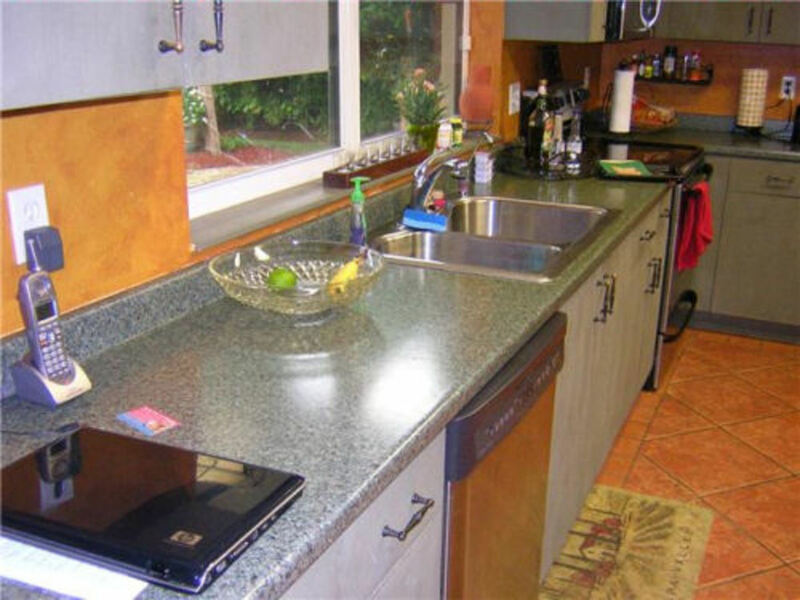 I am amazed daily at how much I love my countertops, even thought they're Formica. 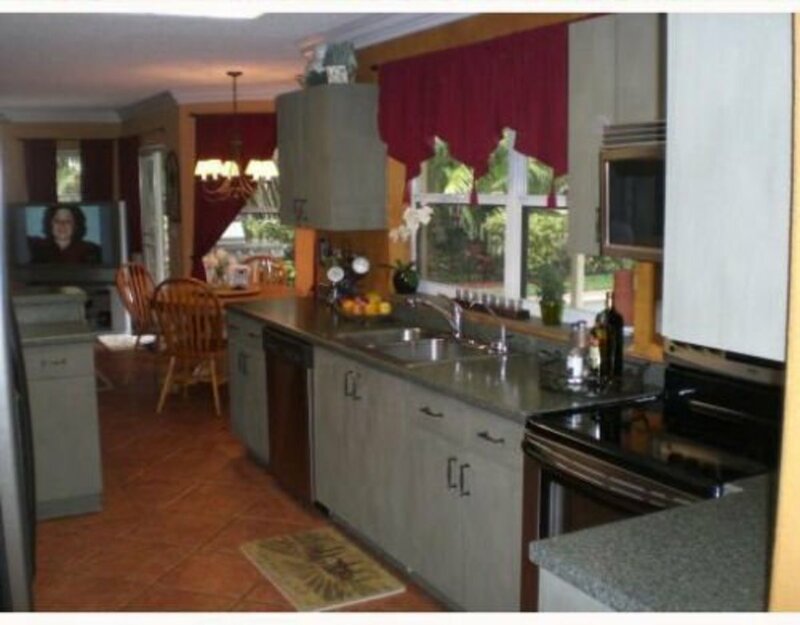 This transformation has allowed me to be satisfied with my kitchen for several years. 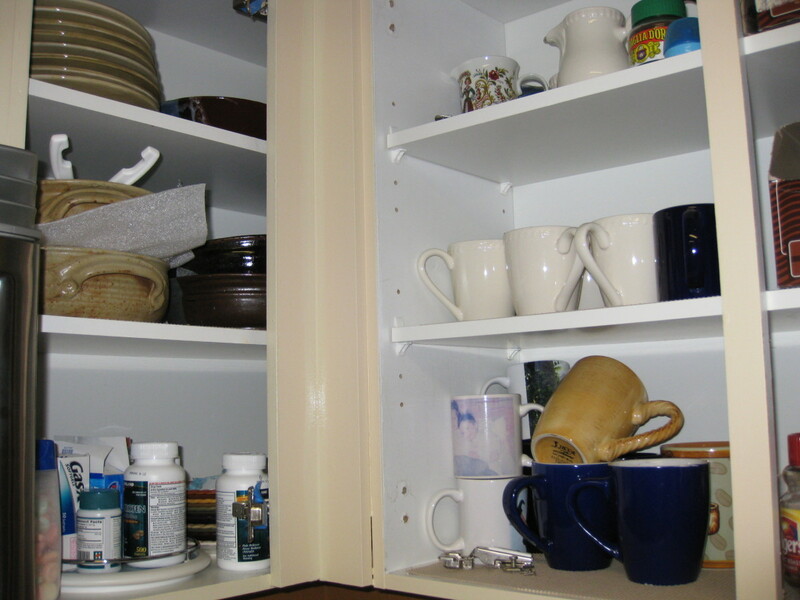 I still hate the cabinets and the lack of efficient storage, but I know that some day my new kitchen will come. For tolerance, it only has to "look" good and it truly does! As a renter, we're always looking for inexpensive ways to update our house. We're lucky in that our landlord is pretty willing to let us make big changes and doesn't resist it. I personally HATE the counter tops in our kitchen. They look like cheap laminate because they are. 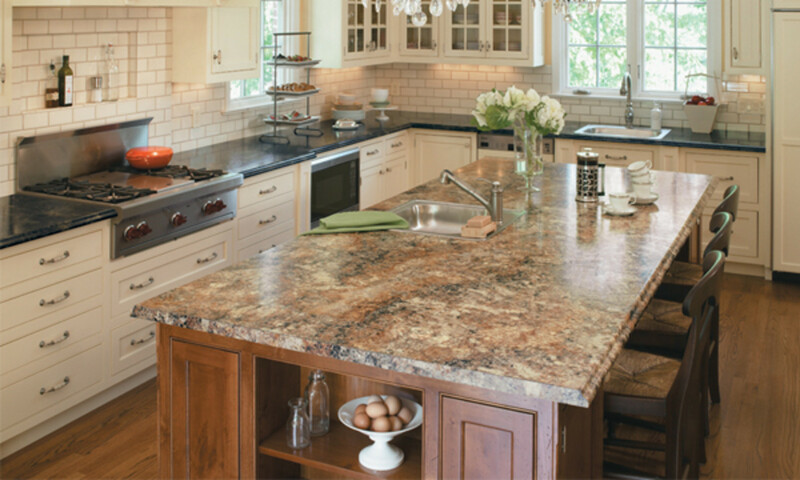 The counter tops you chose are gorgeous, you really wouldn't know they aren't granite! I've pinned this for future inspiration when we get around to upgrading the kitchen. Thanks for sharing! louistoth - sorry somehow your comment slipped by me! 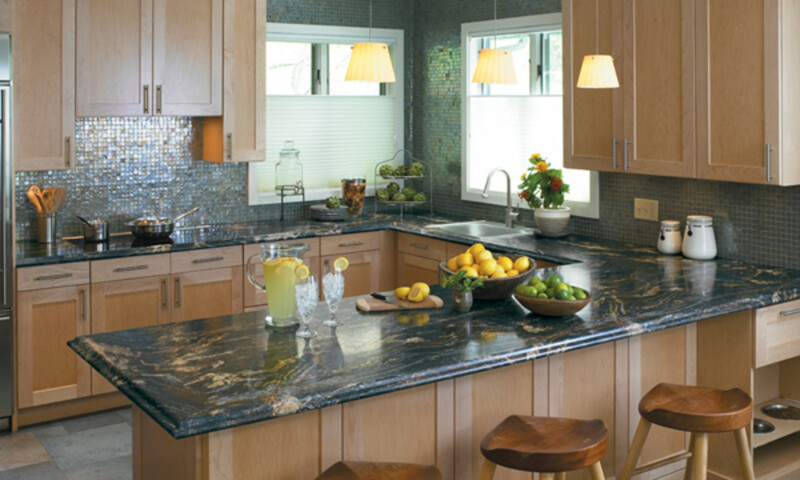 Many people are very fond of black granite and it does look fantastic with white cabinets (and others) but, personally, I'm just not a fan of black anything. It's definitely a personal choice. That's amazingly good.Pics are fantastic.Love reading it. Diane - I'm so excited for you! It's been almost a year now that we've had our FX and I'm still in love with it - my kitchen no longer depresses me and they are very easy to care for. 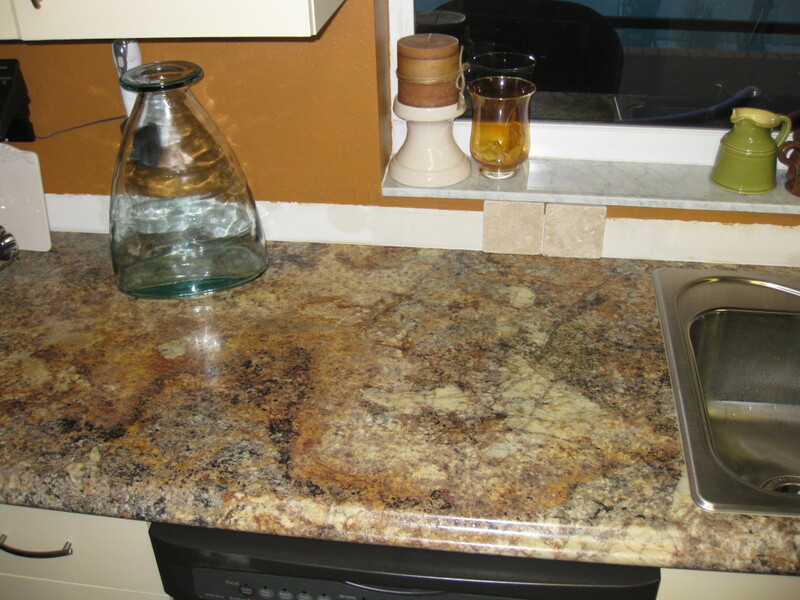 Many friends who have come over thought I upgraded to granite ... until they touched it! I hope you love yours, too. 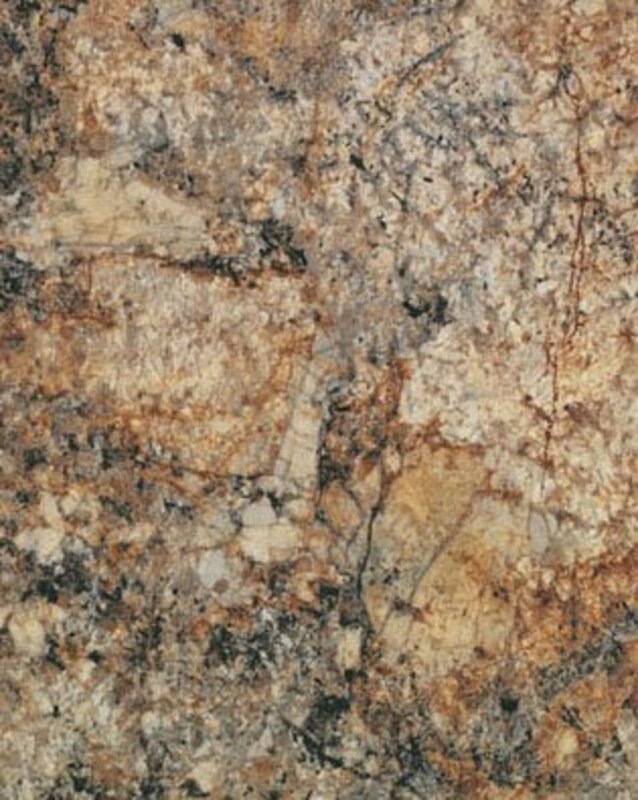 Just ordered the Golden Mascarello and I'm very excited...they are going to look great and not cost the $6k granite estimate we got! Wow! this is great!. very interesting to read.you have a very good skills in writing..keep up the good work! Thank you! I am definitely very pleased at what we were able to do with not so much money. These are great photos and ideas. 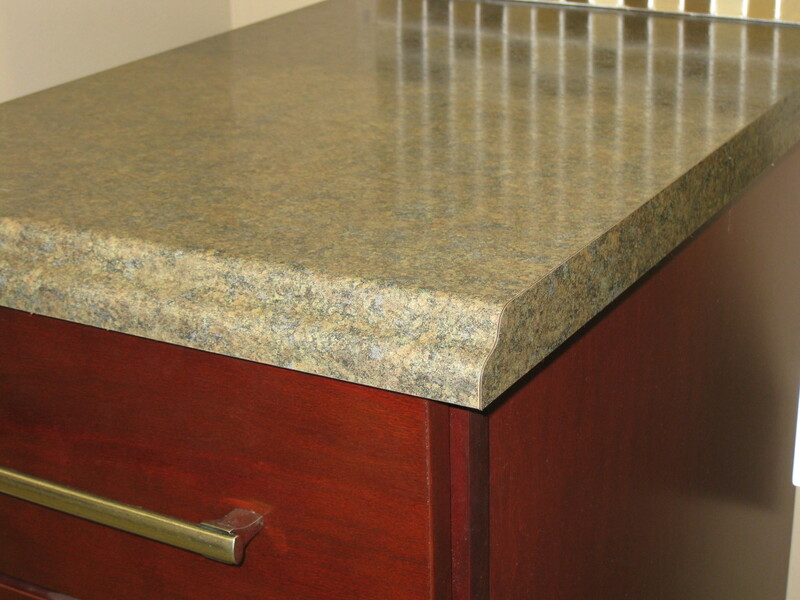 Formica is a great option instead of granite and very affordable. Under $2000 is a great deal for everything that you had done. Way to go! Thanks, GmaGoldie! I've had my Formica 180 fx countertops for a few weeks now and I absolutely LOVE them! My kitchen was completely transformed with new countertops, tumbled stone backsplash and some paint on the cabinets - all for under $2000! Not bad at all! 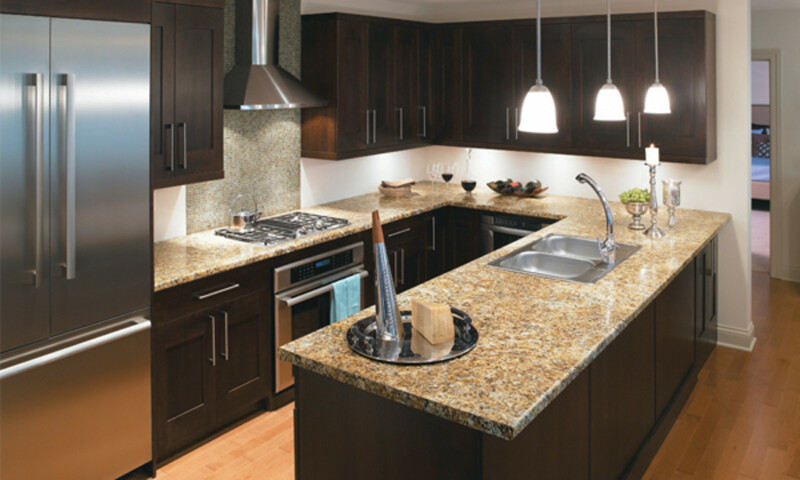 I still like laminate - I know granite is the rage - thank you for offering a real alternative. 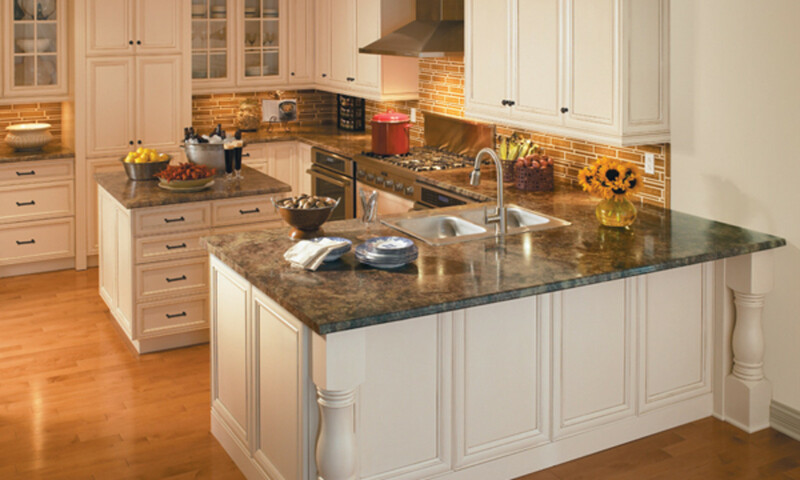 Granite is so very permanent. I like simple and affordable for my space. Very nicely done - you stated what needed to be said. Thank you! So true! Like I said above - I never would have thought I'd be purchasing, let alone excited about, new laminate countertops! It's pretty amazing how far they've come with laminate. 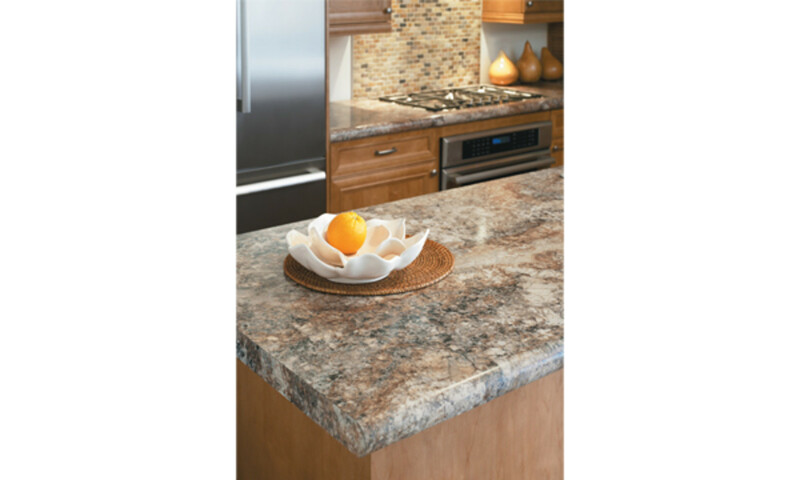 There are some really great alternatives to granite now that are less expensive, but still look beautiful. These are really wonderful and tasteful ideas. Thank you for such a comprehensive hub.